Swings-n-things is dedicated to providing Cincinnati kids and families with high quality out door play sets, trampolines, and basketball hoops. In addition, Swings-n-thing’s co-located sister company, Run Jump-n-Play provides children with themed birthday parties and an amazing indoor playground open almost every day! Swings-n-Things specializes in offering high quality products such as Goalrilla & Goalsetter Basketball Hoops, Vuly Trampolines, Rainbow Swing Sets and more. 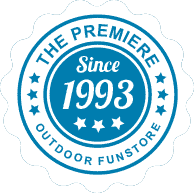 Swings-n-Things is Ohio’s Premier Outdoor FunStore, located in Blue Ash, Ohio. We are conveniently located off of the I-71 Pfeiffer Exit, right behind the Bob Evans! Why are your prices so much less than other companies? We sell our products at the best possible prices. We work hard to make sure you get the highest level of play value for your money. Does my playset need stained when it is delivered? Yes, we offer complete delivery and installation for all of our products. Our average installations take 3-6 hours. Can I install the playset myself? Yes, our playsets are designed to be assembled by mom and dad too. Most of the components are pre built. There is no cutting required. Easy to read instructions allow you to install most of our sets in 3 to 8 hours. We offer a wide selection of Redwood, Cedar, And Southern yellow pine depending on which brand you decide on. Can I add on to my playset later on? That is what sets us apart from many other companies is our modular designs. You can start with a basic playset and add on as your children grow. What type of site preperation is needed before installation? Choose a location with a 6’ perimeter around all sides of your playset. Site should be level although our sets have some adjustability for unlevel yards. We recommend you prepare an area with a resilient surface such as rubber mulch. If we move can I take my playset with me? Yes, we offer complete tear down and re install service or we can just dismantle the playset for the moving company and provide you with an assembly manual if you are moving out of state.